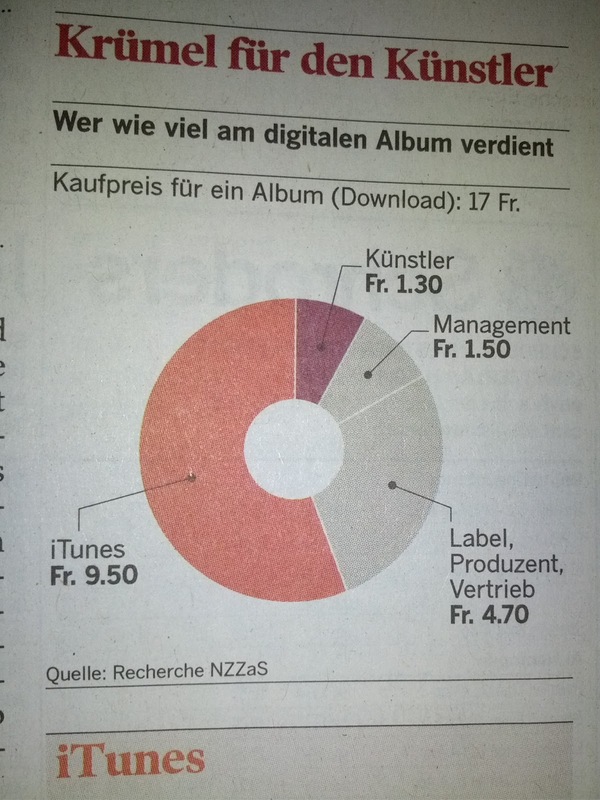 Below is an interesting chart I found on Neue Züricher Zeitung (NZZ - a leading Swiss national newspaper) on how revenues of an iTunes album are split. NZZ researched a 17 Swiss Francs (sFR) download album. The title "Krümel für den Künstler" translates as "crumbs for the artist". Label/Producer/Distributor would have to be specified. My guess is that the producer will get something between 2-3%. But check some more insights here: "Lessons from the music industry"
Nobody remembers download services like Pressplay, Real, etc. anymore. Apple has a clear monopoly in the download sector which is currently being cannibalized by celestial jukebox streaming services like Rdio and Spotify. But as we already all know Apple is working on a music streaming service too. This space is really getting crowded with YouTube, Nokia, Sony, Samsung soon launching their own service.